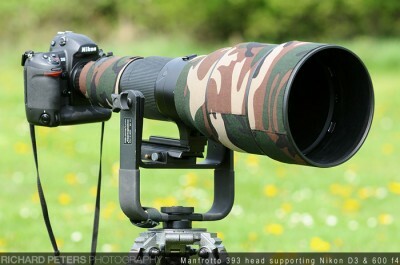 The Manfrotto 393 (or Bogen 3421 in America), whilst not the ultimate in build quality and maybe a tad bulky, it is very sturdy and far from poorly constructed – in fact as you will see from the pictures in this review, mine has quite a few signs of being used and abused out in the field but it still works as good today as it always has done. Once you have attached it to your tripod you can adjust the stiffness of the cradle via the two knobs on either side of it. The 393 is heavy and strong enough to support lenses right up to 600mm primes and even the Sigma 300-800. The head comes with it’s own plate, as it does not support the Arca Swiss style plates, but it locks in place with a rotating lever and also has a safety release catch so the lens can’t slip off the cradle if it’s not tight enough. If your shooting with big heavy lenses and long focal lengths, this style of head is a must. It works mainly on friction with a bit of counter balance to remove the weight of your camera setup. You can move the inner ‘U’ up and down by using the other screw positions as this helps get the pivot point of your lens, which is required for counter balance (this is where the WIMBERLEY MKII comes in to it’s own). However it isn’t ‘that’ useful due to the limited positions of the holes and way in which you take the ‘U’ apart, which is why it’s designed more to work with friction via the knobs. You can literally push a 600mm around with your little finger once you are up and running though. And the great thing is, whatever position you move your camera in to, as soon as you let go it stays there thanks to those friction knobs. Added to that the maneuverability you get it’s also excellent for panning shots and shooting unpredictable subjects such as birds in flight as it lets you quickly and effortlessly swing your camera about. To lock the cradle down you twist the two knobs either side, although doing this means you have to adjust them back to where they were before when you want to start shooting again, which could result in missed shots if you are caught out and want to set down and shoot something quickly. I got round this by using a screw in the outside of one of the cradle arms. You screw this through to the inside arm and it locks everything down for transportation without losing your friction settings – I’ve used this method the entire time I had the head and it worked very well allowing me to always have the friction setting exactly where I wanted and the head easily lockable for walking round with even the 600 hanging off the end. This locking screw is also used when you wish to remove the camera body from the lens. Again it saves having to tighten your friction knobs if you want to swap bodies. Without tightening the tilt, removal of the camera would make the setup front heavy, causing the lens to drop down. You may have noticed in one of the image above, the cradle was above the lens, with the lens hanging off of it rather than sitting on it. I did not use mine this was round as I prefer having the weight of the lens resting on something rather hanging from something, plus it makes long lens techniques harder because it’s not as easy to press your arm down on the lens. Due to the design of the head, you may find the cradle gets in your way slightly when trying to keep it steady with long lens technique – and, depending on your lens you may have to ‘reach round’ to get to some of the controls on the lens. It’s not of major concern and easy enough to navigate round the problem but it is worth a mention. For some, especially those who use manual focus or focus pre-set on newer lenses, may find themselves having to reach around the head to get at the focus ring etc. Pan movement lock, or lack thereof! This is probably my main grumble about the head…you can’t lock the pan motion, so when your walking about you have to be careful not to let the lens swing about and clump you one in the head! The pan friction can be adjusted although it requires an Allen Key to do so, it isn’t designed to be changed on the fly. Despite the small flaws I found when using it, it is still a very good product for the price (roughly 3.5 times cheaper than a Wimberley) and will support lenses up to the Sigma 300-800. I used the 393 for a couple of years. It was originally given to me on a semi permanent loan, and as I upgraded through the ‘equipment ranks’ my list of items to upgrade never had the 393 near the top as it always suited my needs just fine, even when I started using a 600mm – it’s only been replaced now because after years of upgrading everything else the tripod head finally made it to the top of the list so I puchased a Wimberley MKII. But the bottom line is, this is a very very good product for the price! If you live in the UK the Manfrotto 393 can be purchased from Warehouse Express. And if you live in America the 393 can be purchased from B&H Photo and Adorama.